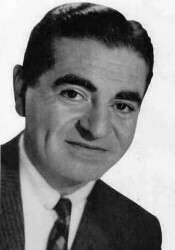 Jack (Jacob) Barkin, tenor, was born in Uman, Ukraine, 23 April 1914. He emigrated to Toronto as a young child and became a naturalized Canadian in 1930. Jacob Barkin studied voice with his father, distinguished Cantor Abraham Barkin, and subsequently at the Toronto Conservatory of Music, the Eastman School of Music, and in Philadelphia with the great teachers, Euphemia Giannini, and Giuseppe Boghetti. He also studies in piano. Jacob Barkin followed his father into the Cantorate, and accepted his first full-time pulpit in Philadelphia. In the same time he became one of the favorite tenors on the radio networks, and commuted regularly to New York, where he appeared as featured soloist on all three networks at one time. It was following one of these broadcasts that he was invited to come to the West Coast, where he was very active in film soundtracks and made his debut with San Francisco Symphony under Pierre Monteux. In 1946 he was called to Washington D.C. as Cantor of prestigious Adas Israel Congregation. He rapidly gained recognition as one of the prominent and active musical figures, and after having introduced much into the general musical life of the Capitol, made his debut with the National Symphony Orchestra, in the first all-Jewish concert dedicated to Jewish Music in America, in 1949, at Constitution Hall. Throughout his 20 years of residence, he perfomed in more than 900 concerts in Washington, which included several appearances before 3 Presidents, and was the recipient of the Presidential Centennial Medal. After intensive studies with the renowned Fausto Cleva and Leopold Sachse, Jacob Barkin made his operatic debut in "Rigoletto" in 1957. He has traveled over 4 continents and has been guest soloist with most of the leading orchestras, among them: New York Philharmonic; Boston Symphony; Chicago Symphony; Detroit Symphony; San Francisco; Minneapolis; Baltimore; Toronto; Mexico City; Lima Peru and more than 15 appearances with the Israel Philharmonic. He has been associated with leading congregations in America, and was the successor to Richard Tucker at the Concord Hotel for 7 years. 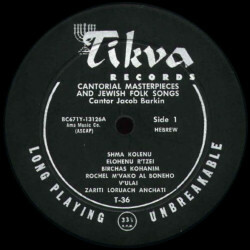 Jacob Barkin also served as a Cantor in Pittsburgh, San Francisco, Toronto (Holy Blossom Temple 1967-1969), and Detroit (Shaarey Zedek Congregation). He moved to Florida ca 1980 and continued to appear as guest cantor in the USA for special religious services through the 1980s. Jacob Barkin died in Miami Beach, Florida, 27 February 1993.